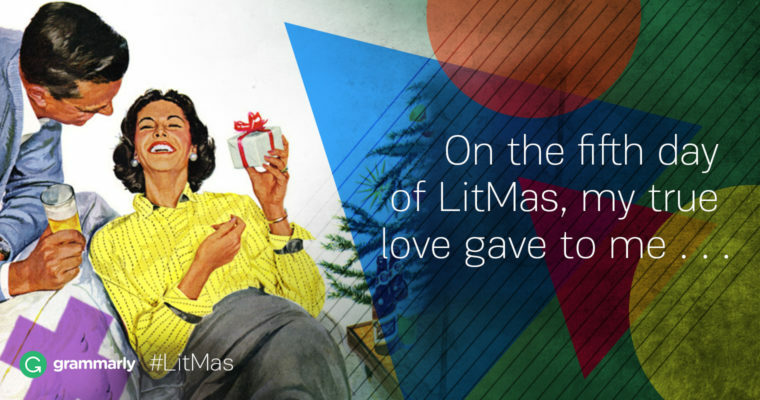 On the fifth day of LitMas, Bloggr gave to (you) . . . Five golden gags, Four reading tips. Three French phrases, Two Christmas stories, And a poem that is wintery. For our fifth installment, here are five games, jokes, and memes you can use at your office holiday party. Depending on where you work, we know these events can range from joyous to joyless. If you need something to entertain the boss or appease the trendy interns, we’ve got you covered! Try one of these jokes to keep the season bright and festive. Who doesn’t love a good Mad Lib? We tested this holiday story in a hilariously raucous Facebook Live video that You can also read the resulting story below. I received your letter with your gift requests, and I have a few questions. I appreciate you writing to me faithfully every year since you were teenage, and I know this year has been difficult for you, since your pet wombat passed away. You’ve been the tallest boy this year, and I’ve added you to the frisky list, of course. Also, I’m happy to get a pac man for your sister Jennifer Lawrence and crystal ball concert tickets for your brother Tom Hanks, and thank you for thinking of them during this warmest holiday season. It was your list that struck me as odd. Why, for instance, do you need a bear under your tree? I highly doubt it will fit! I’m not sure I can procure lumber before December 25, since it’s very rare and expensive. Would you accept fuzzy socks instead? By the way, I’m not sure your mother Ellen or your father Denzel Washington would be very happy if I made you a chainsaw. They’re quite dangerous, you know! Could I just make you a toy truck instead? Also, here are a few reminders for when I visit your house. Please make sure no creatures are stirring, not even an otter. Also, I require the customary baklava and wassail as I become quite famished on these gift-giving runs. (And don’t forget caviar for the reindeer!) Do you have a toaster? Will your parkas be hung by the toaster with care? For I certainly will be there! I want to bring joy to all children, including you, so please advise on replacements for these items. I casually await your response. But why let Bloggr dominate the party? Surely you have a few millennials in your office who would benefit from a good go-to game this holiday season. Try this mad lib on your younger coworkers and let us know how it goes in the comments! I received your [form of communication] with your gift requests, and I have a few questions. I appreciate you writing to me faithfully every year since you were seven, and I know this year has been difficult for you, since your pet [animal] passed away. You’ve been a very [adjective] boy this year, and I’ve added you to the [adjective] list, of course. Also, I’m happy to get a [game] for your sister [female celebrity] and a [gift] for your brother [male celebrity], and thank you for thinking of them during this warmest holiday season. It was your list that struck me as odd. Why, for instance, do you need a [animal] under your tree? I highly doubt it will fit! I’m not sure I can procure a [weird gift] before December 25, since it’s very rare and expensive. Would you accept [gift] instead? By the way, I’m not sure your mother [female celebrity] or your father [male celebrity] would be very happy if I made you a [dangerous toy]. They’re quite dangerous, you know! Could I just make you a toy truck instead? Also, here are a few reminders for when I visit your house. Please make sure no creatures are stirring, not even an [animal]. Also, I require the customary [food] and [drink] as I become quite famished on these gift-giving runs. (And don’t forget apples for the reindeer!) Do you have a [source of heat]? Will your [article of clothing] be hung by the [source of heat] with care? For I certainly will be there! I want to bring joy to all children, including you, so please advise on replacements for these items. I [adverb] await your response. Everyone knows one person in the office who just can’t let a sentence end on a preposition, constantly corrects who and whom, and has deep, abiding emotions related to the Oxford comma. Or maybe you are that person. Either way, here’s a grammar meme to keep the grammar love alive in your office. 3 A Brief Holiday Joke for Your CEO Executives are notorious for their short attention spans, so don’t make your holiday jokes too long when chatting up someone with a “C” or “VP” in their title. Want a short, appropriate joke to impress the higher-ups? Check out this one from Pinterest. If your first holiday Mad Lib went well, there’s a chance your colleagues might want another. If your holiday party isn’t going so well, it might be time to try another Mad Lib on your ever-patient audience. Give this one a shot, and let us know whether it sleighed or bombed in the comments! [Famous person] the [adjective] magician lived in a run-down cottage at the edge of [city name]. One afternoon, after a recent [adjective] snowfall, he donned his [article of clothing] and [color] top hat and headed into town with his faithful [type of animal] sidekick, [animal celebrity]. As he walked, the [adjective] wind, a thing that seemed to possess magical powers of its own, kicked up and whisked his hat away. The breeze was so strong that the airborne hat soon disappeared from the magician’s sight. He sighed and [verb ending in -ed] on through the snow. Things just hadn’t been going his way. Why, just the night before he’d performed for a [adjective] little group of [living things (plural)]. When he’d gone to pull a [type of animal] from his top hat—his [superlative] trick—he’d pulled out a [kitchen implement] instead. As he came into town, he encountered some children [verb ending in -ing] and [verb ending in -ing] around a/an [adjective indicating size] snowman. “It’s [male celebrity] the Snowman!” they cheered. The magician drew closer to peer at the snowman. It had two [round object] eyes and a [vegetable] nose. To his surprise, the magician saw that the snowman was [verb ending in -ing]! He was also wearing the magician’s top hat. “You can talk!” the magician cried. The magician scratched his chin [adverb]. If his top hat was magical after all, then perhaps he should try to take it back. And yet, [verb ending in -ing] seemed to make the children feel [positive emotion]. Taking it away would certainly make them feel [negative emotion]. Then he was struck with a/an [adjective] idea. So, the magician and the snowman put together a/an [adjective] show, which they called [sitcom title], and performed it all winter long. The show soon became [adjective]. They performed [adverb] until the spring thaw arrived and the snowman [verb ending in -ed]. But the magician wasn’t worried; he knew the winter winds next year would bring the snowman around again someday. Everyone knows “that guy” who makes puns constantly on work chat and near the coffee machine. Want to beat him at his own game? Try this classic holiday pun. What’s your favorite joke for the holiday season? Let us know in the comments below! У нашей организации классный интернет-сайт , он описывает в статьях про http://top-obzor.com.